My trip to Mcleodganj was unexpected and unplanned. I simply landed there with a group of friends without any hotel booking or any idea as to what to expect from it. I suppose that is what often makes for a great story. A little bit about this place. 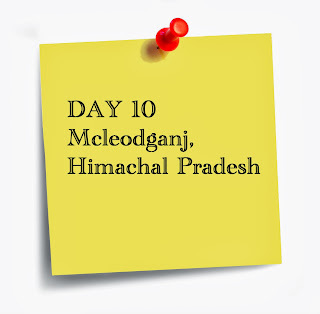 Mcleodganj is also known as Upper Dharamsala, was named after Sir David McLeod, a Lieutenant Governor of Punjab, while the suffix ganj is a common Hindi word for ‘neighbourhood’. 1) Book a room before you arrive. Since it’s a small town, it tends to get packed quickly during peak season. 2) If you like shopping, you are going to love the Tibetan style jewellery—especially with the turquoise stones—sold in the markets here. But unfortunately, shopkeepers don’t bargain at all. In rare cases, they might. You just have to try your luck. On the other hand, if you want to pick up souvenirs like Tibetan thangkas, prayer flags, varieties of tea or T-shirts adorning the Tibetan flag, you may find decent bargains on them. Oh, and didgeridoos too. 3) However short your trip to Mcleodganj may be, do visit the Tsuglagkhang complex. Located at the end of the Temple Road, it is Dalai Lama's residence. It also houses a monastery with a statue of Sakyamuni Buddha, a temple and a museum resonating with depictions of Tibet’s history and its struggle for freedom. The complex also houses a café and bookshop. 4) For authentic Tibetan food, grab a bite at Snow Lion restaurant on Jogibara Road. They have yummy momos and thukpa, aside from generous portions of pastries. 5) Most of my trip was spent in coffee shops here. I tried Moonpeak Espresso, Mandala Coffee House, First Cup Cafe and Coffee Talk. While I was impressed with the quality of coffee, I was even more enthusiastic about its dirt cheap prices. A cup, which by the way resembles the giant ones from the TV show Friends, will set you back a meagre Rs. 40-50. Airport), approximately 125 km from Dharamsala and 20 km from McLeodganj. By rail: The nearest railhead is Pathankot. From here it is a three-hour journey to Dharamsala, and then a 1-hour journey to McLeodganj. By road: Buses ply daily from Delhi to Dharamsala. You can book a Volvo from the Himachal Roadways Transport Corporation buses or private buses through a travel agent. I stayed in Bhagsu, 2 km from Mcleodganj, at a new hotel called Surya. The rooms here were clean, spacious and had a balcony with a mountain view.